It was a whirlwind of events taking our summer to fall, then finally closing 2016. We brought back some old events (with some twists), and were thrilled to bring some brand new events as well. We love these “extras” we can offer to our community at Novo, because it gives us all a chance to be together for longer periods of time, and to get some great “hang out” time between workouts. Of course, food and yummy treats and drinks from our friends at Juice Bar Columbus is always a perk. And who doesn’t love giving back to charitable organizations in our community? These events take a TEAM to plan and pull-off, so a big shout-out to our amazing staff of teachers who give so selflessly to set-up, clean-up, and teach at these events! It would truly be impossible without them. Summers at Novo are always fun. We welcome back students who have been away at school, get to see our morning moms at different times, and sweat out the long summer days together. This past summer, we featured to major events – Buti and Braids and (back by popular demand) Move Through Midnight. We were thrilled to partner with the talented girls from Salon 501 for a night of braiding, glowing, and sweating. The Salon 501 team taught us how to do several different types of braids and then we were able to practice on each other with our new skills. After braiding, we painted with neon paint, then worked it out in a super-sweaty and fun glow-in-the-dark Buti Yoga class. In July, we brought back the popular “Move Through Midnight” event, featuring mini-classes of each of our methods offered. The final class literally worked it out through the 12am mark with a mini-session of Buti Yoga. Add a huge sale, drawings and giveaways, and snacks, and you have a fun-filled evening that lasts into morning. All proceeds from this event went to Seneca, Choices for Life. 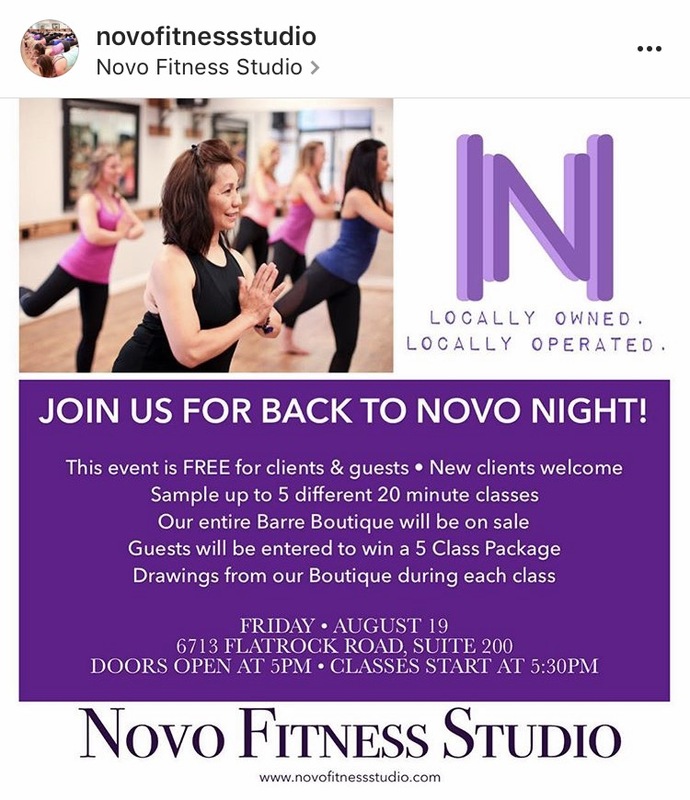 We closed summer and welcomed back-to-school with our “Back to Novo Night.” This free event featured 5 sample classes for new and existing clients, and we were thrilled to welcome many new faces coming through our doors! In September, we participated in Live Healthy Columbus’ Uptown Day. We loved getting to be part of this amazing community event promoting wellness and health! It was wonderful to meet and chat with other business owners in our field, as well as welcome guests by our booth. “Toes on Top” was an actual dream-come-true event for us. We wanted to take Buti Yoga out into the community and out into nature, and this event did just that! Our friends at Old Town Columbus let us use their rooftop venue – “The Vue,” and we filled the entire space with 50+ amazing women who worked it all out under the stars. Juice Bar Columbus brought delicious juices for after the class, and also a big thanks to RX Bars, who donated boxes of yummy and healthy bars for participants! We were able raise over $1,200.00 for Seneca, Choices for Life. Also in October, we welcomed the tiny toes of our barre babies for a baby-wearing combo class! If you think a typical class at Novo is difficult, try adding a human to your body weight for the entire duration of the class! This was NO JOKE, and these mamas did an amazing job. Of course it always helps to have precious babies to distract you through the pain of the workout! Once again, we brought the men to the barre for “Barre Bro Date Night” in October. This event is always a fun time for the girls, and the guys are always great sports about “shaking to change.” All proceeds of our PINK barre bro night went to the National Breast Cancer Association. We challenged our clients with a “25 in 5 Challenge” during November and December. Clients had 5 weeks to get 25 classes in, and boy did they! We didn’t have enough room on one poster to write all the participants, and actually ended up filling two posters full of names for this challenge. And of those participating, 36 participants met or exceeded the goal, with Sarah Sluder taking 1st place at 77 classes (an average of 3 classes a day!). 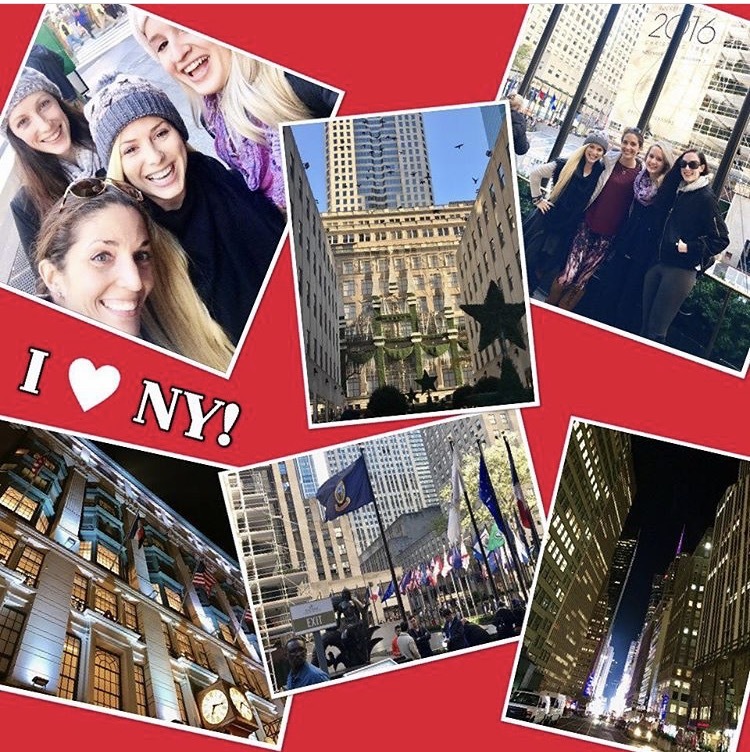 The highlight of our November was our trip to NYC with two of our senior instructors. We had a full 3 days of sweating it out as students at multiple studios, and we LOVED getting to be students at some top-notch studios in the area. As a bonus, we walked miles each day to get from studio to studio, which was the best way to see the city and get a “warm-up” for our workout simultaneously. It was a fun, exhausting, inspiring trip and we can’t wait to go back again. We were beyond thrilled to offer our first EVER bellicon rebounding classes during our second annual “Shake n’ Shop” event. Not only did we demo 3 bellicon bouncing classes, but we transformed our studio room into a small business fair for Christmas shopping. We loved featuring several of our clients as vendors, and we welcomed over 60+ shoppers/clients as well. Also in December, we celebrated the “12 days of Novo” by bringing in canned goods for Valley Rescue Mission. Our clients donated over 160 canned food/non-perishable items.